It looks like SemiAccurate’s moles were dead on, today AMD released their HD7970GHz edition with clocks right where we said they would be. It is also not a new ASIC, just new bins opened by TSMC process improvements. To be honest, our moles were not dead on, but they were really close. At Computex, they said Tahiti 2 would be released the following week at between 1050 and 1075MHz. Their little chirps translated to human speak did say that it was not the new ASIC we keep hearing about, just a new bin. How did they do? 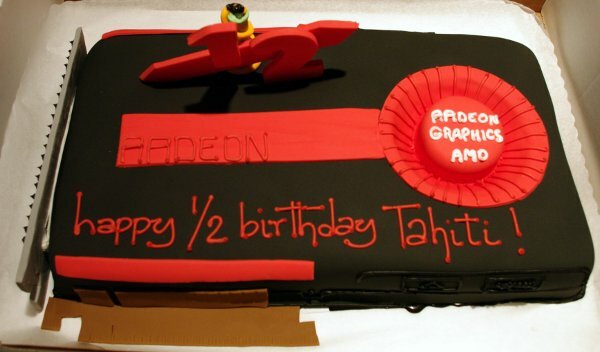 At AFDS last week, Tahiti 2 was not released, but the press was briefed, release was the week after. The HD7970GHz edition is indeed not a new ASIC, and clocks in at 1000MHz base, 1050MHz with a new ‘turbo’ boost we were not told about. This is all brought on by process improvements on TSMC’s 28nm that ups the yield of lower leakage parts, enough to make a product out of. A product that is actually available in volume, unlike some other competing GPUs. All in all, not bad for a small furry mammal sweating in the Taipei heat. That said, it may not be a new ASIC, but there are significant improvements to the drivers, and several new features not in the original that are now exposed. The main one of these is the new ‘turbo’ feature, something that is going to be misunderstood by many. AMD has had power management and ‘turbo’ enabled for a long time, it just wasn’t set to go over the top frequency of the card. AMD’s turbo is a very sophisticated system that estimates power used based on workload to react in times that are orders of magnitude faster than traditional methods. Those traditional methods, direct amperage measurement and temperature, are so slow that while in HD7000 class parts, are only really there for backup. You might recall that AMD has had their Powertune available since the 6900 series, and it worked quite well, especially when the competition was using external power clamping hardware to (sometimes) keep the smoke in their cards. The Nvidia 6xx series parts fixed much of that, and touted a turbo feature that not only bumped clocks down, but bumped them up too. This was spun as a feature that AMD couldn’t match, but in reality, it was just marketing hype. Why? Because the clocks a company sets for low use/minimum, base, and turbo are arbitrary, if you can move clocks up and down, you can move clocks up and down. The base states picked are mostly irrelevant if the chip reacts to inputs and load correctly. It either does what it is programmed to do or it does not. With the HD7970GHz, AMD decided to set the base clock at 1000MHz and allow a 50MHz turbo. They could have just as easily set it at 1050MHz base and let it ramp down on light loads like the non-GHz edition. Performance would have been exactly the same because the algorithms that control boost, throttling, and steady state operation are the same. It is semantics really, more marketing driven then tech. The 7970GHz will move between four distinct voltage levels, and has 256 clock steps to play with in the turbo range. Since that range is a subset of the 1050MHz clocks, the steps that the GPU can move in are likely sub-1MHz. That should be more than good enough for most people, and extract the maximum the silicon can deliver at any given time. There is one big and not semantic difference between the AMD approach to turbo and the Nvidia version, the AMD turbo is deterministic, the Nvidia one is a lottery. What do we mean? AMD guarantees that all 7970GHzs will be able to hit 1050, and you can always jack clocks up from there with their driver tools. Nvidia’s version isn’t guaranteed, and given the large number of reports about retail clock speeds, or lack thereof, it looks like the press samples are able to do things the overwhelming majority of retail cards can’t. Imagine that luck, almost like the press were given cherry picked golden samples that don’t reflect real world chips. Then again, that would be unethical and sleazy of a company to do, so it must be coincidence. Time and time again. The short story is that if you buy a 7970GHz card, you will get 1050MHz out of it. If you buy a GTX680, you are pretty much guaranteed not to get what the reviewers got, or even what the box promises. The 125MHz speed bump that the 7970GHz gets over the 7970 non-GHz represents nearly a 15% increase in clock speed, and to keep pace, memory also goes from 1375MHz to 1500MHz. While that is a bit less than a 10% speed increase, the 7970 was rarely if ever memory bound, so this bump is more relevant to overclockers than average users. In either case, the speed boost is not one dimensional.